English mathematician and scientist Alan Turing (1912–1954) is credited with many of the foundational principles of contemporary computer science. 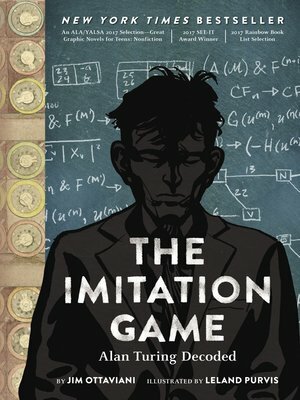 The Imitation Game presents a historically accurate graphic novel biography of Turing's life, including his groundbreaking work on the fundamentals of cryptography and artificial intelligence. His code breaking efforts led to the cracking of the German Enigma during World War II, work that saved countless lives and accelerated the Allied defeat of the Nazis. While Turing's achievements remain relevant decades after his death, the story of his life in post-war Europe continues to fascinate audiences today. Award-winning duo Jim Ottaviani (the #1 New York Times bestselling author of Feynman and Primates) and artist Leland Purvis (an Eisner and Ignatz Award nominee and occasional reviewer for the Comics Journal) present a factually detailed account of Turing's life and groundbreaking research—as an unconventional genius who was arrested, tried, convicted, and punished for being openly gay, and whose innovative work still fuels the computing and communication systems that define our modern world. Computer science buffs, comics fans, and history aficionados will be captivated by this riveting and tragic story of one of the 20th century's most unsung heroes.